I'm popping in to show you how to use a plate collection in your home decor and the easiest way I found to hang a plate collection. With many of our friends and family located out of town, having welcoming room for our house guests is a happy necessity. But I'm a wee bit embarrassed to admit that our guest room has been somewhat neglected for the past year. Last summer I repainted the room and updated the bedding, but never got around to decorating it as had planned. 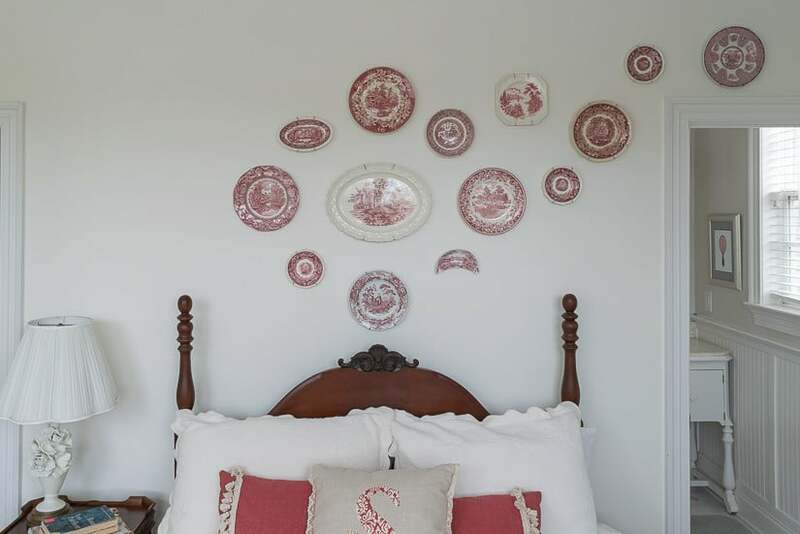 The bed skirt is a red toile and I had it in my mind that a red transferware plate wall would be pretty cool. Both the toile and the transferware are fairly traditional decorating styles, but I'm rather an un-traditional decorating style gal, so I wanted to ‘un-traditionalize' the room as I continued to decorate it. One way I hoped to tone down the traditional was by making my plate wall asymmetrical and wandering. I started gathering red transferware from a variety of local antique stores and from ebay. I wasn't concerned that my plates were in pristine collection; in fact, a few nicks here and there would add to the character of the wall. 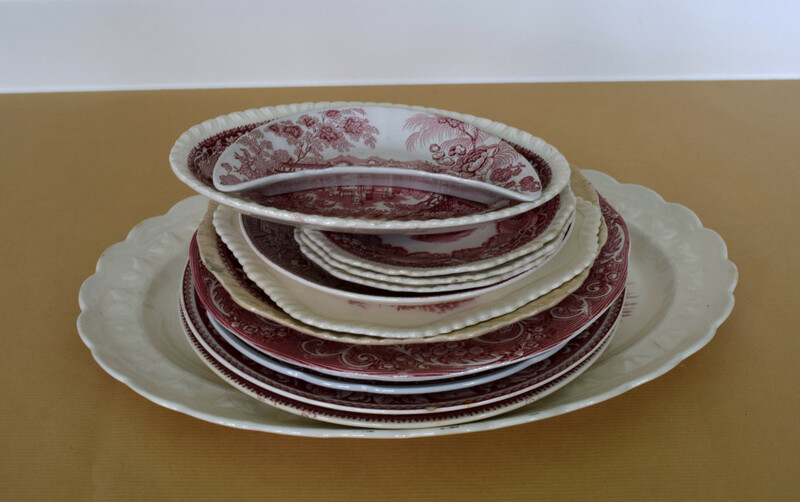 I accumulated 14 plates of different shapes and they've been sitting in a stack in the guest room for the last 6 months. One of the perks of blogging is that I'm motivated to get my projects done, and my recently completed plate collection wall is one of the ‘to-do's' that has finally been moved to ‘done'. Accumulate your plates and plate hangers. I opted to go with the traditional wire hangers as opposed to the kind that stick with glue on to the back of the plate as these will be hanging over a bed and there were a few reviews of plates becoming ‘unstuck' and falling. I'm fairly confident that plates raining down on my guests at night would not fit in with the ‘welcoming' feel I'm working towards. 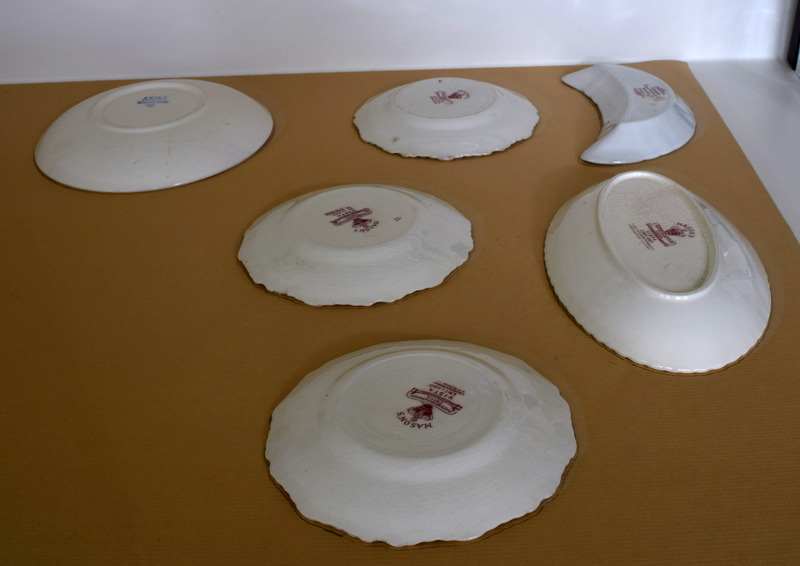 Get a piece of paper big enough to place all your plates on upside down on. Cut out each ‘paper plate'. Fold each plate into 1/4ths, making sure that your quarters are equal. Arrange your plates. You'll see I took 2 pictures. After having taken the first photo, I realized that I didn't like the way the plates flowed on the right side ( a little too ‘organized'), so I moved a plate and it made all the difference, as shown in the second photo. 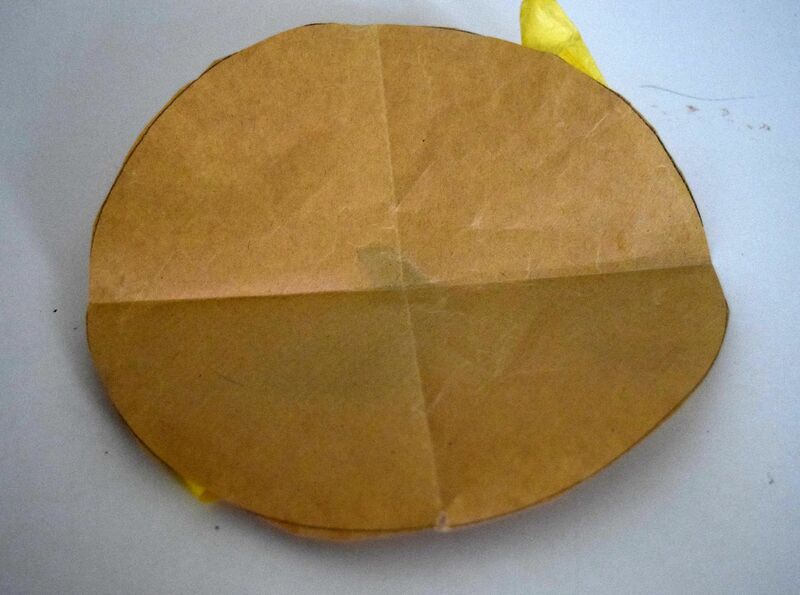 By folding your circles and lining up the folds with a ruler and level, you can make sure that your plates are lined up if you want them to be so. I lined up the 4 at each axis around the platter in the middle and then just eyeballed the rest. 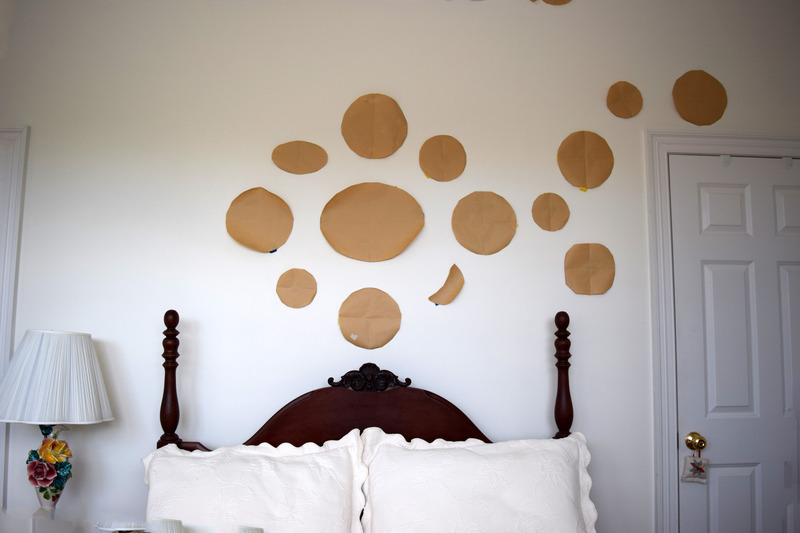 Once your paper plates are up the wall, the rest is easy and rather fun! Measure your hanger. 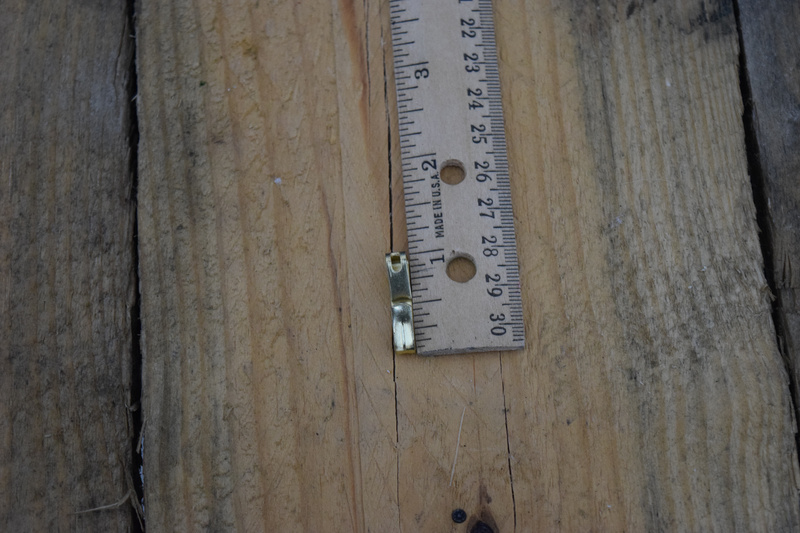 The hangers for my plates measured 1″ from the nail hole to the hook where the plate would attach. Measure the length from the top of the plate to the place on the plate hanger where it will attach to the wall hook. In the photo below, it was an 1 and 1/8th of an inch. 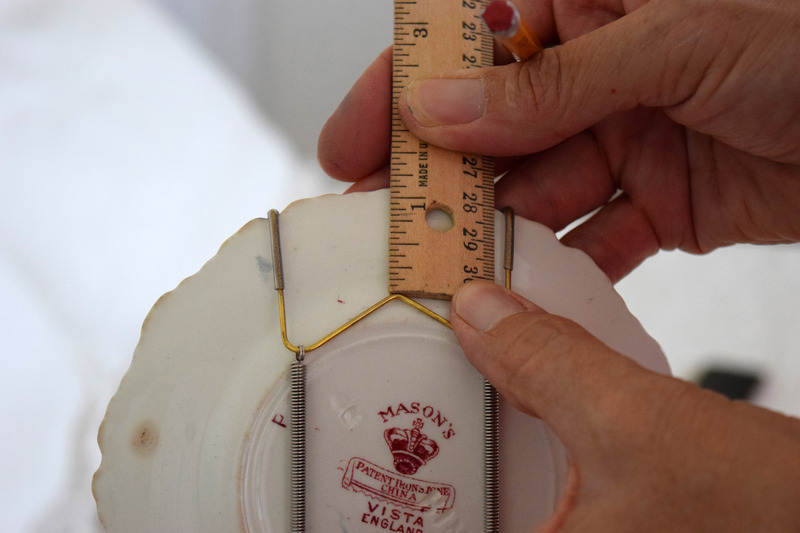 Measure down, in this case 1/8th of an inch from the top of your paper plate and place your nail there. Hammer away. Hang your plate. If it's good, then tear away the paper and you're done! Step back and enjoy your wall. I love the way it looks, but think I have room to pop up a few more plates, so I'll keep my eyes open when I wander antique stores. But here's the rub. Are you familiar with the children's book, “If You Give a Mouse a Cookie?” It was one of my kids all-time favorite books when they were younger. The gist is this: if you give a mouse a cookie, he'll surely want a glass of milk. Once you give him the milk, he'll need a straw, then a napkin, then a nap, and so on and so on. So this is now my “if you hang a plate wall, then you'll need to fix up the lamp” room. Once you fix up the lamp, you'll need to get some pretty pillows for the bed. Once you get the pretty pillows, you ought to get one of those bedside carafes with a tumbler on top. You can see where this is going, right? Well, Kate's off to school, so I'll have all this time on my hands…right? In any event, my project queue is growing, which is fine with me. Thanks for stopping by to visit today, I appreciate you more than you’ll ever know. And when you leave a comment…ah, it makes my heart sing! If you want to see what I'm up to from week to week, sign up here for updates. Taping paper plates to the wall to work out the arrangement is genius! My house was built in the 50’s so when putting a nail in the wall, you need to be sure where you want it to go! Thanks Karen! I’m pretty tickled with it as well. I love it when something works out as planned! See you next week. I love the fact you didn’t keep them symmetrical, which would have looked great but this will start a conversation! My first impression was it looked like the Big Dipper star formation which of course makes me,think of nighttime, and peaceful sleep. Hi Ann, I always lean asymmetrically..just in my genes! Wow, love the Big Dipper observation…think I’ll adopt it and share it with my guests. A little subliminal suggestion. Hi Lynn. Just landed on your blog tonight and I’m enjoying clicking around. I had to comment here for sure because I also have a love for red and white transferware. Isn’t it the prettiest? I really like the way you spread it across the wall. Good Morning Stacey, thanks for spending a little time with me yesterday! I love it that you browsed around the guest room. I popped over to your house and felt right at home in your dining room with all of your beautiful transferware and toile. It is a classic combination! Thanks for visiting and hope to catch up with you again soon! Great tutorial. Thanks for sharing. I love the asymmetric placement. Hi Mary, I’m so glad you found it useful and I’m an assymetrical gal as well. Happy plate hanging! Hi Mary, thanks for stopping by. I’m so glad you found this useful…are you doing your plate hanging soon? If so, have fun.